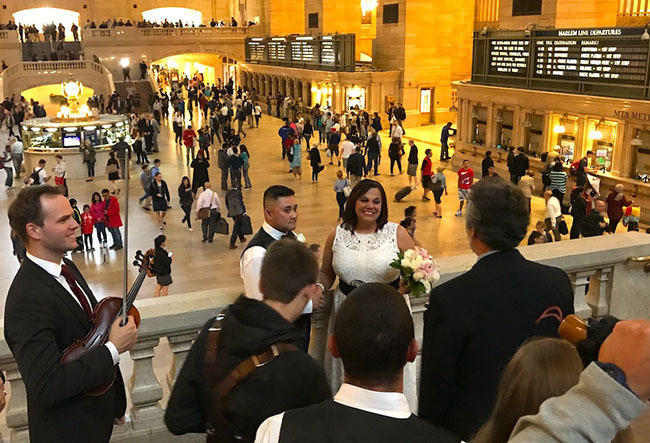 NEW YORK – You can spend a small fortune on tickets to go to a Broadway show, or you can just hang out at Grand Central Station and wait for a show to come to you – such as this quite real wedding. The happy couple had planned their ceremony at an outdoor location, but the weather turned sour rapidly and unexpectedly, and they bolted for someplace with a roof. Grand Central Station certainly was more memorable than an office building lobby. So what if thousands of people were scurrying by, some within just a few feet of their joyous occasion? The couple was dry, smiling and willing to proceed, just as were the officiant, the violinist and the wedding photographer, plus scores of spectators who cheered and applauded despite not knowing the couple.